Cutaneous nodules can be successfully diagnosed on fine needle aspiration cytology (FNAC) as primary epithelial tumors of the skin, cystic lesions, few soft tissue tumors, and metastatic tumors. The cytological diagnosis of primary skin adnexal tumors is not always possible because of a scarcity of reports describing cytology of adnexal tumors. However, the knowledge of cytological features of these lesions is vital for their appropriate management. The present study highlights the cytological findings of two rarely described benign skin adnexal tumors. 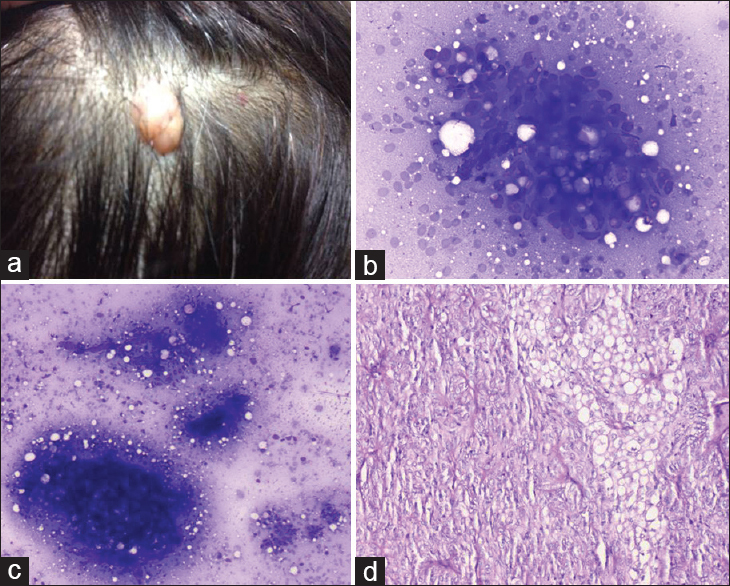 A 46-year-old female presented with a nontender, nonmobile, elevated firm, yellow-colored nodule measuring 1 × 1 cm over the scalp [Figure 1]a. FNAC smears were cellular and revealed two cell populations arranged in sheets, clusters, and scattered singly. One population comprised of cells with moderate amount of finely vacuolated cytoplasm, oval-to-spindle nuclei having bland nuclear chromatin, and inconspicuous nucleoli. The other population was of basaloid cells [Figure 1]b. Few clusters showed a mixture of these two populations along with eosinophilic stroma [Figure 1]c. A diagnosis of benign adnexal tumor possibly of sebaceous origin was given. Subsequently, excision and histopathological examination was done. Cut surface of the swelling was solid gray-white to yellow. Sections revealed a fairly circumscribed tumor in the dermis involving the subcutaneous tissue and focally reaching up to the epidermis. The tumor comprised of irregularly-shaped lobules with two types of cells, small round-to-oval basaloid cells admixed with larger cells having round vesicular nuclei and moderate foamy cytoplasm [Figure 1]d. Many typical mitosis (1–2/hpf) were seen. Histological features were diagnostic of sebaceoma. A 19-year-old male presented with an asymptomatic pigmented scalp swelling measuring 1.5 × 1.5 cm [Figure 2]a. FNAC smears revealed tight clusters and dispersed small polyhedral to cuboidal cells with cytoplasmic granularity [Figure 2]b. Many cells with cytoplasmic brown black pigment were seen along with specks of calcification [Figure 2]c. A diagnosis of benign adnexal tumor was given. Subsequently, excision and histopathological examination was done. Cut surface showed a full thickness, irregular solid growth with black discoloration. Sections revealed a tumor arising from the epidermis extending into the dermis as broad anastomosing bands of uniform, cuboidal tumor cells with indistinct cell borders, round-to-oval basophilic nucleus, and few showing intracytoplasmic melanin pigment [Figure 2]d. In between the tumor cells, narrow ducts lined by eosinophilic cuticle and multiple small cysts were also seen. Histological features were diagnostic of eccrine poroma. The diagnosis of skin adnexal tumors by cytology is controversial because these lesions are clearly manageable by excision. However, a cytologist may have to face the challenge of diagnosing these lesions as it is documented in the literature in only a few large case series and case reports.,,,,, Hence, the awareness of the cytologic features of skin adnexal tumors is essential. FNA of skin adnexal tumors can reveal three different arrangements of cells. Tumors with follicular differentiation show tightly cohesive branching sheets of cells. Flat sheets and groups of cells in glandular pattern are characteristic of sweat gland carcinoma and hidradenoma. Presence of small cells is a feature seen in spiradenomas., The pattern of cellular arrangement along with clinical details facilitate a cytological diagnosis of skin adnexal tumors. The presence of clusters with both basaloid and vacuolated cells along with stromal fragments in a lesion prompts a diagnosis of adnexal tumor of sebaceous origin.,, Cells having clear cytoplasm may be seen in other adnexal tumors and can be confused with mature sebocytes seen in sebaceoma. Presence of multiple vacuoles and an eccentrically placed nucleus in mature sebocytes differentiates them from clear cells of other adnexal tumors. In addition, the cell clusters in sebaceoma show maturation of sebocytes in the same cluster. Presence of vacuolated cells can lead the cytologist to think of tumor of an adipocytic origin, however, these tumors lack the basaloid cells, hence distinguishing them from sebaceoma. A differential diagnosis of basal cell carcinoma with sebaceous differentiation may also be considered on cytology, but it will show sheets of basaloid cells with peripheral palisading. Special stains such as Oil red O and Sudan IV on fresh tissue can confirm the diagnosis of sebaceoma. In the present case, similar features were noted, and thus a diagnosis of benign adnexal tumor possibly of sebaceous origin was rendered. Various authors recommended a diagnosis of benign eccrine tumor in presence of cohesive clusters of polyhedral-to-cuboidal cells and cytoplasmic granularity., Histologically, there are three variants of eccrine poromas; benign, premalignant, and malignant variants. The benign eccrine tumors can be differentiated from the malignant porocarcinomas cytologically by lack of tight tumor islands with geographic contours, large, atypical cells without any differentiation, pleomorphic hyperchromatic nuclei, increased mitosis, necrosis, and absence of dual population of cells. The present case lacked features of malignancy, but presence of cells with intracytoplasmic pigment was misleading, and hence a broad diagnosis of benign adnexal tumor was given. Majority of eccrine poromas are devoid of melanocytes; pigmented variant of eccrine poroma is rare. Consequently, the presence of melanocytes in a lesion with cytological features favoring an adnexal tumor with eccrine differentiation should not deceive the cytologist. Although precise subtyping of skin adnexal tumors may not be possible on cytology due to a lack of reports describing their cytomorphological features, an attempt should be made by the cytologist to identify these lesions. With this case report, we strive to emphasize the cytological features of sebaceoma and eccrine poroma. In tumors with sebaceous differentiation, the presence of foamy cells with vacuolated cytoplasm and presence of polyhedral and cuboidal cells in tumors with eccrine differentiation can aid in diagnosis. Layfield LJ, Glasgow BJ. Aspiration biopsy cytology of primary cutaneous tumors. Acta Cytol 1993;37:679-88. Gangne N, Joshi D, Sharma SM. Cytomorphological diagnosis of malignant eccrine tumors: Report of two cases. Diagn Cytopathol 2008;36:801-4. Prayaga AK, Loya AC, Gottimukkala SR, Digumarti RR, Maddali LS, Challa S. Cytologic features of primary malignant tumors of skin and adnexae. Acta Cytol 2008;52:702-9. Rege J, Shet T. Aspiration cytology in the diagnosis of primary tumors of skin adnexa. Acta Cytol 2001;45:715-22. Dey P, Das A, Radhika S, Nijhawan R. Cytology of primary skin tumors. Acta Cytol 1996;40:708-13. Daskalopoulou D, Maounis N, Kokalis G, Liodandonaki P, Belezini E, Markidou S. The role of fine needle aspiration cytology in the diagnosis of primary skin tumors. Arch Anat Cytol Pathol 1993;41:75-81. 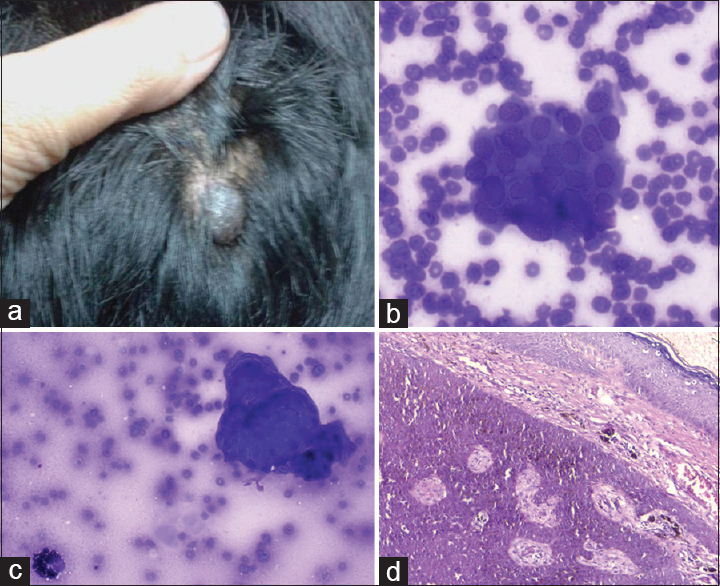 Sabag S, Glick T. Fine needle aspiration of nodular hidradenoma: A case report. Diagn Cytopathol 1996;15:395-7. Kuo HW, Ohara K. Pigmented eccrine poroma: A report of two cases and study with dermatoscopy. Dermatol Surg 2003;29:1076-9.